During the construction of the New Old South Church in the 1870s, the expectant congregation was temporarily displaced from its old home in the Old South Meeting House. The cause was fire damage. 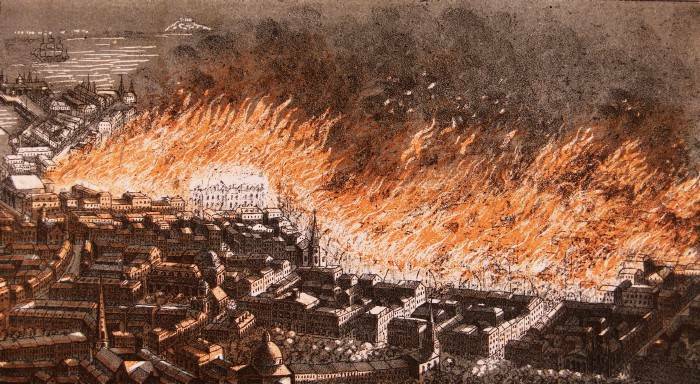 Fire was an endemic problem in American cities in the nineteenth century. Boston’s Great Fire, not to be confused with the Great Fires of London, Chicago, San Francisco, New York or Portland, was anticipated by John Damrell, Boston’s Fire Chief. He actually traveled to Chicago in the aftermath of its huge 1871 fire to study the blaze. Damrell arrived home from Chicago very nervous. He sensibly began developing a fire response plan for Boston. When an epidemic of horse distemper sidelined his department’s animals the next year, he instructed his men to pull their carriages themselves and hired on extra help. He couldn’t prevent the spark that ignited the basement of a dry goods store on the evening of November 9, 1872. I left the Dutch picture-books…and went to the north window. Nothing there. We see a good many fires in the northern hemisphere, which our windows command, and always look, when we hear an alarm, towards Charlestown, East Cambridge, Cambridge, and the towns beyond. Seeing nothing in that direction I went to the windows on Beacon Street, and looking out saw a column of light which I thought came from the neighborhood of the corner of Boylston and Tremont streets, where stands one of the finest edifices in Boston, the “Hotel Boylston,” put up by Charles Francis Adams. The fire looked so formidable, I went out thinking I would go to Commonwealth Avenue and get a clear view of it. As I went in that direction I soon found that I was approaching a great conflagration. There was no getting very near the fire; but that night and the next morning I saw it dissolve the great high buildings, which seemed to melt away in it. My son Wendell made a remark which I found quite true, that great walls would tumble and yet one would hear no crash, — they came down as if they had fallen on a vast featherbed. Perhaps, as he thought, the air was too full of noises, for us to note what would in itself have been a startling crash. The fire spread, destroying 800 buildings. Old South Church, only damaged by the fire, but still standing, actually represented a major victory for the firefighters. In all, 30 people died, but Damrell’s preparedness is credited with sparing the city the extent of damage suffered by Chicago and other major cities. Nevertheless he was sacked from his post in 1874. With his career in Boston ended, he launched a bigger campaign, to enact a national building code. 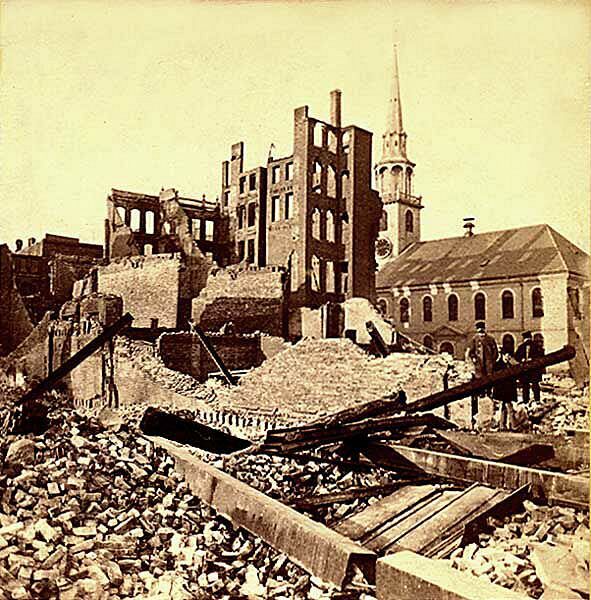 After the jump, a series of stereoscopic images of the aftermath of Boston’s Great Fire. This entry was posted in Boston, Images and tagged 1872, Commonwealth Ave, Great Fire, John Damrell, Old South Meeting House, Oliver Wendell Holmes. Bookmark the permalink.